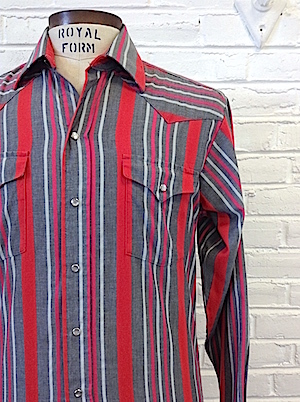 (M) Mens Vintage Western Shirt Gray, w/ Red, White, Magenta Stripes! 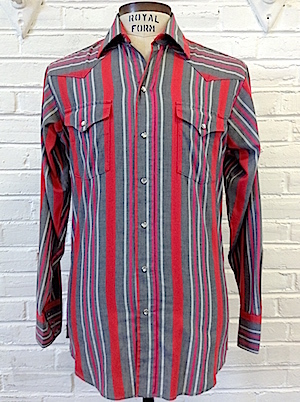 Home > Items just added 4/3-4/17 > (M) Mens Vintage Western Shirt Gray, w/ Red, White, Magenta Stripes! Mens Vintage Western Shirt! Gray base with White, Red and Magenta color stripes running Vertically down the shirt. Pattern runs front back and sleeves. Six Gray snaps down the front with 4 more on each cuff, the last one near the wrist. Snap-Closure MATCHING pockets on each chest. Tapered hem. Tag reads Panhandle Slim. Poly-Cotton. Made in USA.